The skills of passing and catching on the move remain a significant area of deficiency and are areas that can be difficult to teach and drill. 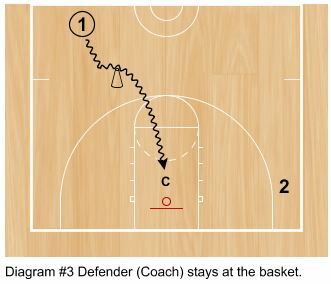 The ability of guards and perimeter players to penetrate with their head up and make intelligent scoring or passing decisions is such an integral part of the game, yet often under-taught and rarely drilled. 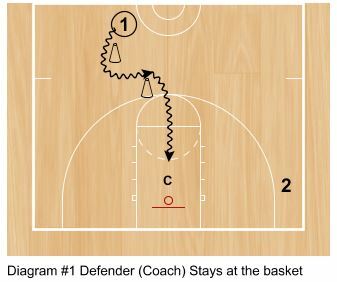 This series of simple drills, involving 2 players and coach, provides some ideas for improving this area and expanding the skill package of perimeter players. 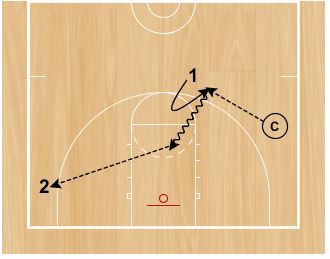 My hope is that you can take something away from this post to break down your offensive system into drills that will help your players. 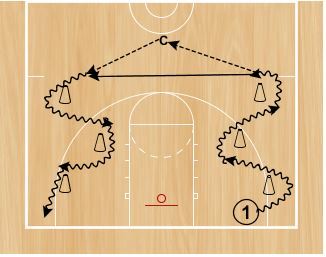 The player begins the drill by doing stationary crossovers dribbles. Player can move one step forward, back, or sideways but should stay in the area of the top of the key. On the command of the coach, the athlete must make a firm, flat pass as quickly as possible to the coach. 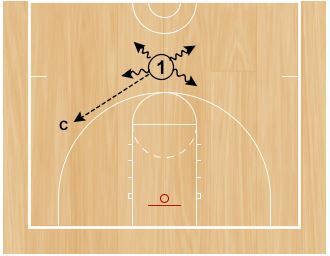 Build up to making a one hand pass straight from the dribble to the pass, drill right and left hand. 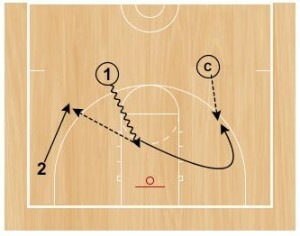 You can also vary the dribble move and use between the leg, behind the back, and other moves in place of a crossover. 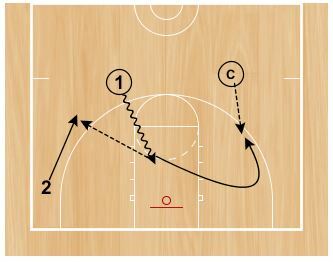 Dribble through the second circuit (full speed again) Emphasis on being quick from the dribble to the pass. Time the drill to push the player to dribble full speed and also to measure improvement. 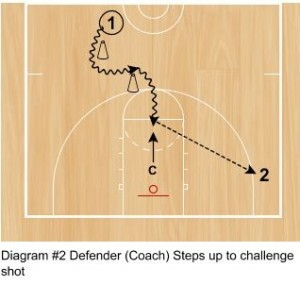 Put the shooter on both sides. 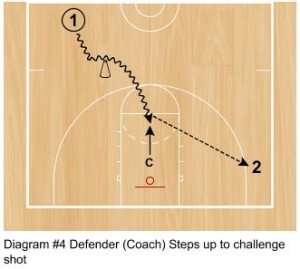 Again, timing the drill to get 10 reps with no turnovers provides motivation and is helps to measure improvement. If the coach stays under the basket (Diagram #1), the guard pulls up for a shot or shoots a floater.